Salt Lake Trapper Dave Baggott picked up the game-winning hit, but he also took time to praise the pitcher he hit it off, Jamie Cangemi, according to The Deseret News. He did so to explain why he hit it to the opposite field. "I hit it to left tonight because that guy throws good old country hard stuff," Baggott told The News of Cangemi. Cangemi threw that stuff in his first season as a pro and he went on to throw it in a total of six. He never made AA. Cangemi's career began that year, taken by the Brewers in the seventh round of the draft out of Ithaca College in Upstate New York. At Ithaca, Cangemi helped his team to a Division III regional win in 1985. He gave up three first-inning runs, but then set down 15 in a row, according to The New London Day. Cangemi started his Brewers career at rookie Helena. He got into 28 games, starting four. He went 5-5, with a 6.46 ERA. He got a key strikeout in a July game. He moved to single-A Beloit for 1987 and then single-A Miami for 1988. He had a 5.80 ERA at Beloit and a 4.39 mark at Miami. 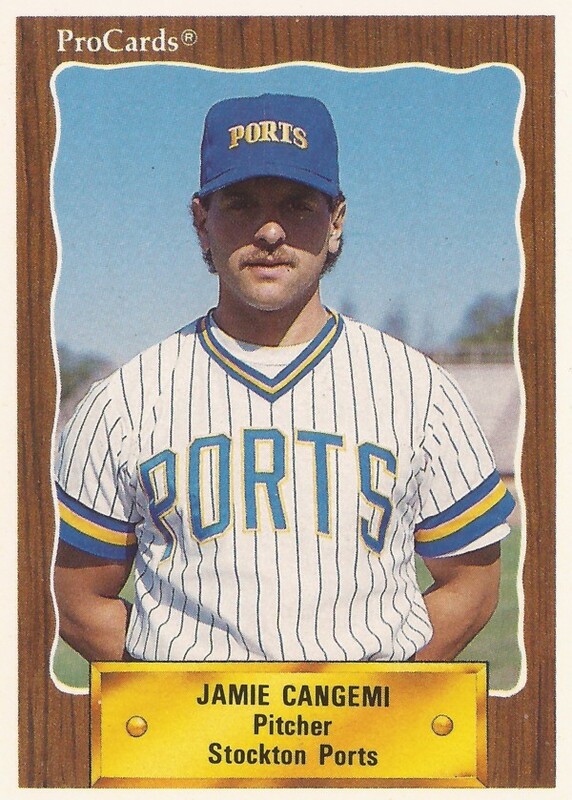 Cangemi played 1989 between Beloit and single-A Stockton, then returned to Stockton for 1990. He gave up two hits in a 1990 playoff outing. His final season came in 1991. Back at Stockton, he went 4-7, with seven saves. He also recorded a 4.31 ERA, ending his career. Cangemi has since returned to his hometown of Syracuse, where he offers pitching lessons in 2015 through the Perfect Practice training facility.